affordable support that you can rely on. that perform brilliantly and offer outstanding value for money. We’ve been trusted by businesses all over central Scotland for 30 years to provide reliable, high quality I.T. Support and now for affordable state of the art security systems. We offer a total I.T. solution. From computer and network maintenance to advanced software development, Microman can ensure that your business runs at peak efficiency and with absolute system security. We now offer the very latest in CCTV and Monitored Alarms for homes and businesses. Perfectly installed and maintened. Microman is the IT Department for many small and medium sized businesses based in central Scotland who don’t need full-time internal IT staff. We suply everything a good IT department would offer your business but at a much lower cost than employing you own IT specialists. We offer an extremely reliable and affordable range of services and have service plans to suit every type and size of business. Make sure that your PC’s and Network are always working completely efficiently and when issues do crop up they’re sorted quickly and effectively with an absolute minimum of fuss. Microman are only a quick phone call away! All the help and advice you need – we talk plain English! We’re friendly, easy to deal with and we absolutely will not bamboozle you with techno-jargon. We give you simple answers to what can be complex problems and can offer you all the clear advice you need on how to plan and implement any kind of system upgrade. We can write affordable custom software for your business that can streamline processes and make you work much more effectively and efficiently. Improve the computer skills of your staff and they will become happier, more efficient and more productive. We offer a wide range of effective training courses that are both enjoyable and rewarding. We offer an unbeatable range of security products, the latest intruder alarms, CCTV systems and a wide range of access control solutions. Our technical and installation expertise will ensure that you get the perfect system for your exact requirements at extremely competitive prices. Why use Microman for IT Support? We have over 30 years of experience in providing cutting-edge computer support. We do everything, from simple PC maintenance to designing fully bespoke software for your business. Outsourcing IT support can reduce business costs substantially and you’ll find that our support service is second to none and our rates are extremely competitive. 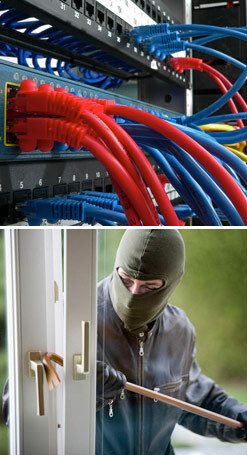 Why use us for Security Systems? Simply fill out the form below and we’ll give you a call. Our customers love the quality of the service we offer, the reliability and the value for money. Why not call us on 0141 266 00 99 for a free quotation?